Cable news channels such as MSNBC are one of the biggest things you’ll miss out on as a cord-cutter, along with live sports and event coverage. Luckily, there are many subscription-based streaming services that let you watch cable news without a cable subscription. In this article, we’ll take a look at the basics of how to watch MSNBC without cable. We’ll discuss your primary options, prices for each subscription service, and other details to help you pick the right streaming service for your needs. As far as we’re aware, there are no legal, free methods for viewing MSNBC streams live on the internet. However, there are a variety of subscription-based “skinny bundles” which will allow you to watch MSNBC coverage of congressional hearings, breaking news, and other political coverage – without crawling back to cable companies. If you’re interested in watching election updates, new coverage, and more, here are some of your top options for watching MSNBC live without cable. Take a look now. Sling TV offers MSNBC, but there’s a catch. You can only get MSNBC if you subscribe to the $25/month Blue package, and then purchase “News Extra” a-la-carte add-on for an additional $5/month. You can’t get MSNBC in the Sling Orange package at all. However, if you go for the above package, you’ll get MSNBC, BBC, Bloomberg Television, Fusion, and RT, so you do get quite a bit for your money if you’re a real news junkie. Another one of the primary drawbacks of Sling TV is that you don’t get free access to a DVR, so you won’t be able to record shows like Rachel Maddow without paying an extra $5/month for DVR access. If you pay for a DVR, you’ll be able to record 50 hours of programming directly on the cloud, with no “expiration dates” or automatic deletion. You are also limited to streaming on 3 devices simultaneously – but this is usually enough for most smaller families. However, Sling TV offers reliable streaming performance, and is available for just about every major streaming platform. Sling TV is supported on Android and iOS devices, Chromecast, Amazon Fire TV, Roku, Apple TV, web browsers, Xbox One, and selected LG WebOS Smart TVs. Sling TV is the least expensive option for streaming MSNBC if you don’t pay for a DVR. If you do choose to add on a DVR, you’ll pay a total of $35/month, which is in-line with most competing online streaming services. You can get a 7-day free trial, so it’s easy to try out Sling TV, and see if you like the service – or if one of our alternative picks will be better for your needs. fuboTV started out as a streaming service that was mostly dedicated to soccer coverage, and this bias still shows through in the available channels. For $44.99, you’ll get access to 80+ channels. While this does include MSNBC and other cable news channels such as Fox News, Fox Business, and Fusion, most of these channels are sports-related, focusing on soccer and other international sports like rugby and cricket. fuboTV does come with a free cloud-based DVR included, so it’s easy to record MSNBC content and watch it later. You can record up to 30 hours of content, and your recordings will persist until you manually overwrite them, with no time limits. If this is not enough, you can upgrade to 500 hours of storage with a $9.99 DVR upgrade package. One of the primary disadvantages of fuboTV is that you are limited to streaming on only 2 devices at once. This may not be enough for larger families, or people who share their accounts. However, you can expand this to 3 streams with the $5.99 Family Share Add-On, if desired. Platform support is solid, but nothing to write home about. fuboTV can be used on iOS/Android devices, Roku, Chromecast, Amazon Fire devices, Apple TV, and some Android TV devices. We’ll be honest here. If you’re really just interested in MSNBC and other cable news channels, fuboTV is probably not the best choice for you. fuboTV has a decent number of news channels, but costs $44.99/month – you can get more channels for less money with a service like DirecTV Now or Sling TV. But if you are a sports fan of any kind, fuboTV may still be worth it. You do get a tremendous selection of sports channels, such as NBA TV and plenty of soccer coverage. If you are interested in both cable news and sports, fuboTV is a reasonable choice. Otherwise, you should probably skip it and choose a different service. With a 7-day trial, you can feel free to make up your own mind. And, if you do like the service, you can get a $15 discount on your first month of service. DirecTV Now offers MSNBC as part of their cheapest “Live a Little” package. You can subscribe to this package for $35/month. If you choose this base-level package, you’ll also get access to several other cable news channels like CNN, Fox News and Fox Business, Telemundo, C-SPAN, and Bloomberg. DirecTV Now offers a pretty good selection of cable news channels, including MSNBC. However, it’s not our top recommendation for a couple of reasons. First, DirecTV Now introduced a DVR in 2018, but you can only record 20 hours of content, which is quite restrictive. Next, DirecTV Now only supports streaming on 2 simultaneous devices. Only the Sling Orange package is more restrictive, allowing only 1 device to stream content at a time. You can add another stream with a $5 month add-on, if desrired. Finally, DirecTV Now has uneven device support. While DirecTV Now supports Chromecast, Apple TV, Amazon Fire TV, Roku, and iOS/Android devices, it lacks support for gaming consoles like the Xbox 360 and Xbox One, and the browser-based streaming app is fairly unreliable on both Chrome and Safari. Despite these drawbacks, DirecTV Now is actually a great choice for AT&T customers with an AT&T Unlimited plan. This is because AT&T has a special deal that allows you to add DirecTV Now for just $20 a month – making it the cheapest option on our list by far. You can get a 7-day free trial of DirecTV Now, so feel free to give it a shot and let us know what you think about the service. Hulu With Live TV is still in beta, but it’s already made a name for itself as a very good cable alternative. For $39.99/month, you get to 60+ channels, depending on your region, and unrestricted access to the entire library of Hulu VOD content from major television networks. 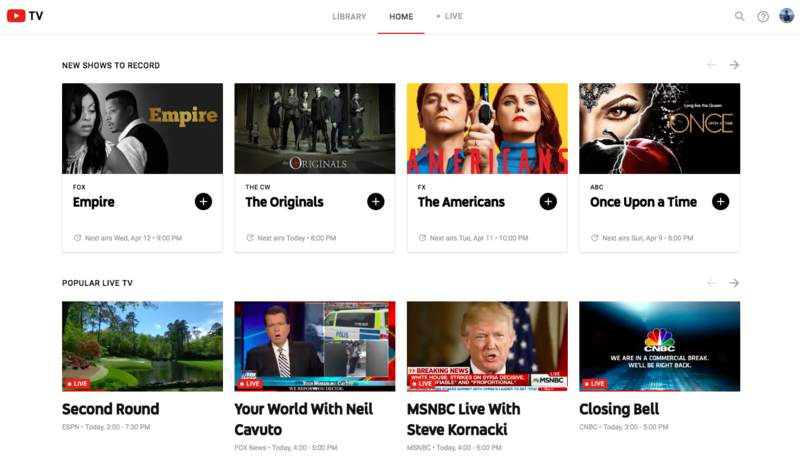 MSNBC comes with the base Hulu With Live TV package, alongside other cable news channels such as CNBC, HLN, ESPNEWS, Fox News and Fox Business and CNN/CNN International. Hulu restricts playback to 2 simultaneous streams at once and offers a free, cloud-based DVR that provides you with 50 hours of storage – no time limits or restrictions. If you’d like to stream on more devices, you can add an Unlimited Screens package for $14.99/month. This allows you to stream on 3 devices outside of your home, and on unlimited screens on your own home Wi-Fi network. You can also upgrade your DVR to 200 hours of storage with the $14.99/month Enhanced DVR package. You can combine these two packages for a $19.99/month if desired. Hulu With Live TV also has outstanding platform support. You can watch live streams on your Android or iOS devices, Apple TV (4th gen or later), Chromecast, Echo Show, Amazon Fire Tablets and Fire TV, your web browser, some Samsung and LG Smart TVs, the Nintendo Switch, Roku and Roku Stick, and the Xbox 360 and Xbox One. If you’re already a Hulu subscriber, this is a great way to watch MSNBC without cable. Because you get a Hulu subscription with the $39.99 package, you’re actually only paying about $32/month when you factor in the cost of your existing subscription to the on-demand Hulu package. This makes Hulu With Live TV cheaper than DirecTV Now, fuboTV, and Sling TV (if you opt for a DVR package). You can check out Hulu With Live TV with a week-long free trial and see if it’s right for you. PlayStation Vue offers a variety of different channel bundles, but if you want MSNBC get the $44.99 “Access” package. In addition to MSNBC, this bundle of channels includes other cable news channels like CNN, BBC America, Fox Business, CNBC, and Fox News. PlayStation Vue is the same price as fuboTV and Hulu With Live TV, and offers fewer news channels. However, there are two things that may make PlayStation Vue more attractive compared to these services. First, PlayStation Vue offers an unlimited DVR. You can record as many shows as you want for up to 28 days, so it’s a great choice for cord-cutters who don’t typically watch live TV, and need extra recording space. Second, PlayStation Vue allows you to stream on up to 5 devices simultaneously on your home network, depending on the devices you’re using. This is better than every other streaming service on this list, with the exception of Hulu With Live TV if you add the Unlimited Screens package. Platform support on PlayStation Vue is also good. You can stream on devices including iOS/Android devices, Amazon Fire TV, Apple TV Roku, and Chromecast, as well as the PlayStation. Xbox consoles are not supported, which is not exactly a shocker, given the rivalry between these consoles. If you can deal with missing out on channels like CNN International and Bloomberg, PlayStation Vue is a good choice, especially if you have a large family and need to stream on numerous devices simultaneously. YouTube TV is still not available in every region around the country, but it is rapidly expanding as of 2018. At $40 month for 70+ channels, it’s certainly a contender for the best way to stream MSNBC without cable. You’ll get access to MSNBC as well as other cable-only news channels like CNBC, Fox News, Fox Business, BBC America, BBC World, ESPNEWS, and Newsy. For the money, this is a really good package of cable news channels. YouTube TV also offers great sports coverage, local channels, and plenty of entertainment channels like FX, TNT, USA, and more. YouTube TV also comes with the best DVR in the streaming business. You get completely unlimited recording storage for up to 9 months in the cloud, and you can record multiple shows, with no limits on simultaneous recordings. YouTube TV also offers simultaneous streaming on up to 3 devices, which is more than DirecTV Now, Hulu With Live TV, and fuboTV. As far as platform support goes, you can watch on some LG, Hisense, SHARP, Vizio, and Samsung smart TVs, as well as Android TV, Chromecast, Roku, Apple TV, Xbox One, and iOS. For $40/month, YouTube TV gives you a lot for your money. If it’s available in your region, it’s a great choice. Depending on what you’re looking for, there are a few top picks for how to watch MSNBC without cable. Here are our choices. Sling TV is #1 in this category. You’ll have to buy a Sling Blue subscription and the News Extra add-on, but you get 10+ cable news channels and some local coverage for just $30/month. You will need to fork over another $5/month for a DVR, however. YouTube TV is our top choice here. For $40/month, you get an unlimited cloud DVR, simultaneous streaming on 3 devices, and a great all-around package of cable channels, including MSNBC. If YouTube TV is not available in your area, we’d recommend Hulu With Live TV or Sling TV instead. They offer similar cable news coverage for a comparable price. If you plan on streaming MSNBC and need support for a large number of simultaneous streams, PlayStation Vue is the best choice. You don’t get as many cable channels as our other picks, but you do get support for 5 simultaneous streams, and a good DVR. Hulu With Live TV + Unlimited Screens package is also an okay choice and gives you totally unlimited streaming at home, but at $54.98/month, it’s pretty costly.